I rescued my girl scully from a junk yard in greenville sc.n in 2002. She was in horrible shape. The guy refused to let me have her at first, but when i threatened to bring the humane society down on him he gave her up no questions asked. She was in a 6x6 chicken wire cage with a pool of motor oil in the middle of it, in her water bowl, and all over her coat. she had flies and was a horrible mess. Once we cut her loose from the cage she broke for my van. 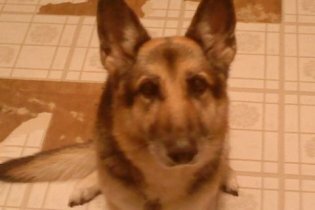 I took her home and bathed her twice to find the most beautiful shepherd I had ever seen. I had the guy send me what papers he had so that i could make sure that she had all her shots. I was shocked to find out that she was a 4th generation champion from a kennel in colorado. In december of 2009, we had to make a decision that would devistate me for ever. I had found out that scully was suffering from accute lymphoma of the throat. On December 19, 2009 we had to rush her to vet due to her having difficulty breathing. after a brief exam, the vet told us what we already knew, that scully would not make it to christmas with us. we said our goodbyes and let the vet do what was neccesary to end her suffering. We will miss her dearly. I still see her running through thte house and hear her collar at night when i am alone in the dark. she still watches over us. We had her cremated and was brought home in a beautiful box. they did a wonderful service for our family. We love and miss scully and know that she is in a better place and that one day we will run together again. may the angels watch her and keep her until I am back with her.